Rarely is home maintenance much fun. That said, now is the time to repair damage and protect your residence. Completing a few simple projects will make a world of difference when guests arrive for summer barbecues and other celebrations. Paint – When was the last time you painted your home’s interior or exterior? If you can’t remember, then it’s probably overdue for a fresh coat. Don’t just consider new paint for the aesthetic benefits. Granted, a recently painted room (hopefully) looks good. But it’s an also an effective way to cover up unsightly marks and appeal to prospective buyers. Shine windows – It shouldn’t cost an arm and a leg to give your home a new sparkle. Believe it or not, cleaning those windows can make quite the difference. We recommend applying a vinegar-water solution to the glass and then wiping it off with crumpled newspaper. Doing so allows for a more lint-free result than paper towels. Caulk – Summer temperatures in Hudson remain relatively pleasant. That said, there are some days when you will need some relief from the heat. If only there was a way to keep indoor air cool and comfortable without cranking the A/C. There is – in the form of caulking. Keep in mind that caulking also prevents water from seeping into walls and causing rot and mildew. Give your furnace some attention – You rely on your furnace for a good chunk of the year. Feel free to remove the filter now that the temperature is starting to heat up. If you notice that it’s dark and dirty, then be sure to get a new one. Don’t hesitate to use a vacuum on openings throughout the system, including registers, ducts, and vents. Insulate water pipes – Here’s a little-known fact: uninsulated pipes carrying hot water through a cold basement wastes heat and costs you money. Fortunately, there are several effective ways to insulate these pipes. You may want to try using pre-slit, hollow core, flexible sleeves made of polyethylene or neoprene foam. Just remember to obtain your pipes’ diameter before getting started. Transform your cabinets – Are you ready to finally make a statement with your cabinets? At St. Croix Cabinet Solutions, we do everything from kitchen cabinet refacing and replacement cabinet doors to cabinet refinishing and more. 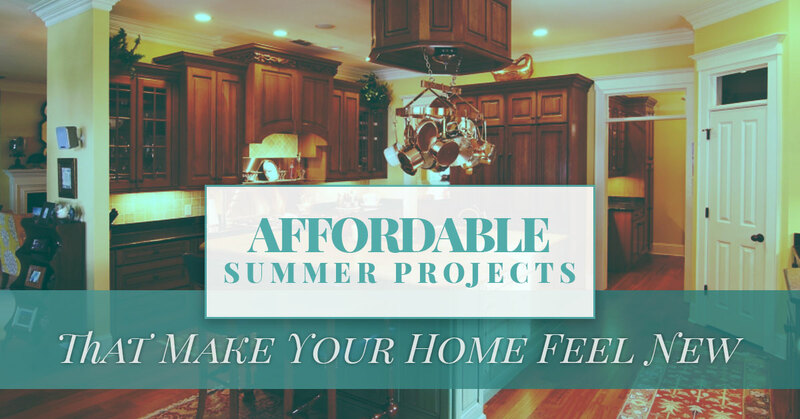 Maybe you’re thinking, “Aren’t cabinet projects expensive?” With some kitchen remodeling contractors, the answer is yes. That’s not the case with St. Croix Cabinet Solutions, though. Part of why so many Hudson residents choose our team is that we have functional, beautiful options for every budget. With our cabinet refacing team, there is no “cookie-cutter” or “one-size-fits-all” mindset. 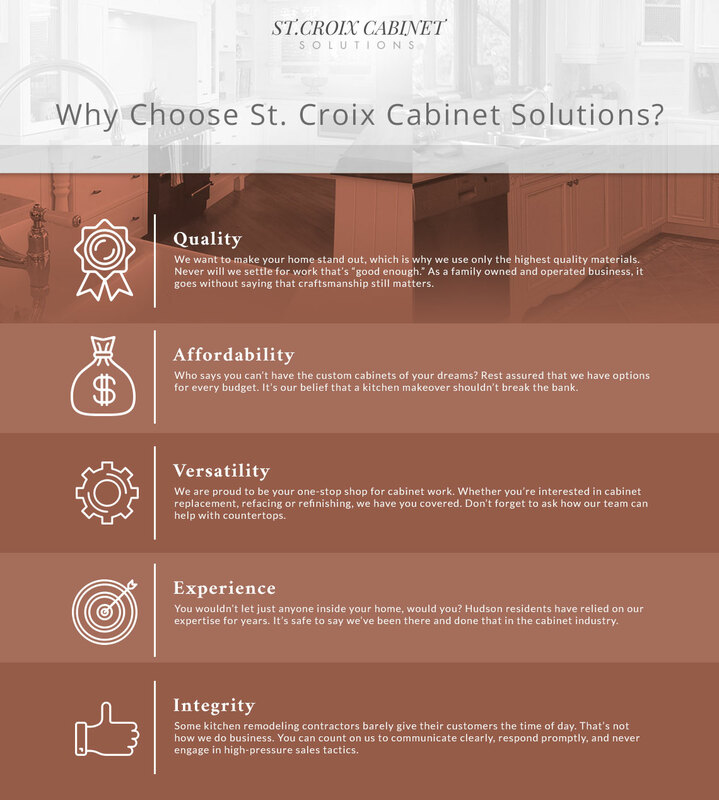 We invite you to see what the pros at St. Croix Cabinet Solutions can do for your home. Our talented team has handled countless kitchen makeovers in the past and we will happily take on your next project.